Like many places, prehistoric Britain was once inhabited by large lizards, woolly rhinos, mammoths, sabre-toothed tigers and so on – though not necessarily all at the same time. A Bit About Britain’s history focuses on relatively recent events, going back a mere few thousand years, though of course the human story begins much, much earlier than that. It is believed that the first primitive primates evolved about 55 million years ago, the first true hunter-gather, Homo Erectus, walked the earth about 1-2 million years ago (give or take) and the direct ancestor of modern man, Homo Sapiens, arrived about 195,000 years ago. The first evidence of a humanoid presence in Britain itself goes back just 950,000 years or so, to primitive hunter-gatherers, who left their tools and footprints in the tidal muds at Happisburgh, Norfolk. These were not humans as we know them; they weren’t even like politicians. 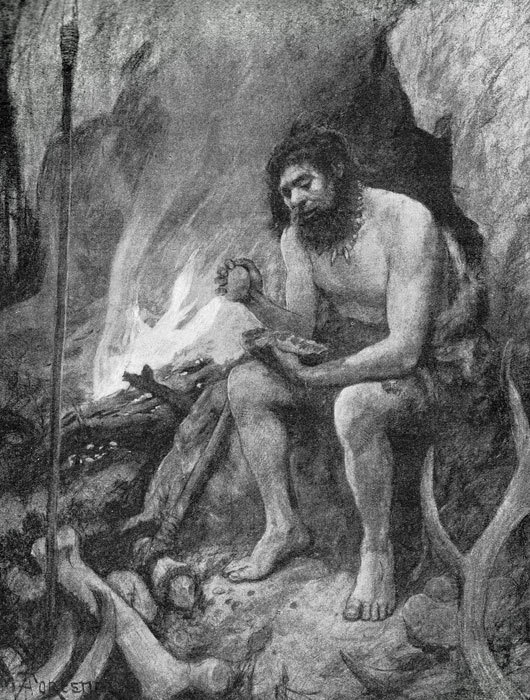 Modern Homo Sapiens arrived in Britain much more recently, about 25,000 years ago, though climatic changes probably meant that occupation was not permanent until perhaps 12-10,000 BC. The last ice age, about 10,000 years ago, covered Britain in ice down to a little south of the English Midlands. At that time, Britain was not an island, but physically joined to continental Europe across what is now the North Sea. This drowned land, known as ‘Doggerland’, is believed to have been fertile and possibly relatively well-populated. It gradually gave way to the rising sea as the ice melted about 8,000 years’ ago (6,000BC) and the land adjusted through a process of isostatic rebounding, as the weight of the ice was removed, leaving the last land bridge somewhere in the region of East Anglia and Kent before this too was inundated. It is doubtful whether the significance of this event was widely recognised at the time – possibly the first hard Brexit. It is believed that the highest part of Doggerland, Dogger Bank, remained as an island until c5,000 BC, when it was finally overwhelmed by an enormous tsunami, created by a volcanic eruption off the coast of Norway. The Neolithic Period (from about 3,000 BC) in Britain saw the construction of burial chambers and ‘henges’, like Stonehenge. The so-called ‘Beaker People’ of the early Bronze Age around 2,000 BC constructed ‘barrows’ – burial chambers – examples of which can be seen dotted around the landscape. There are also in excess of 2,000 hill forts in Britain today. The first hill fort was built about 3,500 years’ ago (1500 BC), though most of these date from the Iron Age (about 750 BC). Development was slower in the north, further from continental European influences. We know that there was regular contact with mainland Europe, and the discovery of intricately fashioned gold torcs (decorative neck rings) in a field in Staffordshire in 2016 suggest sophisticated trade or social exchange. The torcs have been dated to perhaps 400 BC and are thought to have originated from what is now France or Germany. By the later part of the Iron Age, just prior to the Roman conquest (43 AD), the predominant culture in the British Isles was Celtic, apart from a significant portion of Scotland, which was occupied by the Picts, who may not have been ethnically Celtic. The Celts migrated to these islands over a long period of time, probably from central Europe, and are still here in places; the Picts aren’t. We know very little of the Picts – the name comes from the Latin meaning ‘painted people’ – and they disappear from the story, along with their language, after being absorbed by the Scots in the 9th century AD. In any event, immediately before the Roman invasion, the people of Britain were probably tribal. The only written references to these groups comes from the Roman writers, Ptolemy and Tacitus and it is through them that we hear of tribes such as the Durotriges in modern Dorset/Wiltshire, the Atrebates in parts of Sussex, Hampshire and Berkshire, the Iceni in Norfolk and Suffolk, the Brigantes in Yorkshire, Durham and Lancashire, the Votadini in south east Scotland, the Caledones in the Highlands – and the Picts in the north east. Prehistoric man made his mark on the landscape of Britain, clearing vast tracts of forest, as well as leaving behind scores of sites that can be visited today, including stone circles, burial chambers, hill forts, ancient settlements and trackways, giant figures carved into hillsides and strange monuments and standing stones. Their memory is also preserved in Britain’s museums, which contain thousands of artefacts, ranging from primitive stone and bone tools, to beautiful and stylish Celtic jewellery.